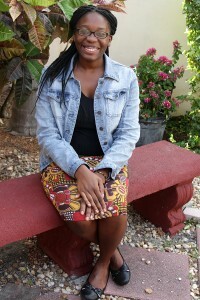 When Guerdiana Thelomar planned to start her summer camp in Haiti, she never expected to be selected as the University of Miami’s 2014 Frank Newman Fellow. The award recognizes students working toward social change. Her summer camp will begin this summer. “I submitted my application, Friday, February 28 and the following week I found out. I was like ‘woah, didn’t I just send this yesterday?’” she said. Thelomar, a double major in human and social development and visual journalism, found out about the award March 5. The selection of the Newman Civic Fellow is part of a national initiative by Campus Compact, an organization dedicated to strengthening the connection between higher education and effective community engagement. According to Vanessa Navarro, a member on the selection committee of the civic fellow award, Thelomar was recognized for her project called Generation Hope: Haiti Summer Camp, which is a three-day program for children in Haiti that will seek to foster self-esteem, explore passions and teach skills to gear youth to create change. Thelomar’s project also landed her a spot in the Clinton Global Initiative that hosts an annual meeting to affect world change. “Thelomar’s current project was inspired by a conversation with a young man living in the Haitian village from where members of her family immigrated, in which he expressed to her an almost complete lack of hope for his future,” said psychology professor Laura Kohn-Wood, who wrote one of Thelomar’s recommendation letters. Thelomar met the person who inspired her project in Port-au-Prince and was moved by what he had said to her. “There was one kid, and I asked him what he wanted to be and he said ‘in Haiti you don’t dream,’” said Thelomar, who admits that the environment she witnessed in trips to cities in Haiti, such as St. Marc, Cange, Gonaives and Port-au- Prince, shapes youth to lack ambition. Including Thelomar, a group of six UM students, comprised of sophomores and juniors, applied for the fellowship. They were looking to join the other 196 students chosen as Newman Civic Fellows from colleges across the nation. The award specifically honors individuals who show leadership potential that is assisted by their college education. At UM, a selection committee from the Butler Center and the Office of Civic and Community Engagement evaluated the applications. Navarro said she was impressed with Thelomar’s involvement. Thelomar believes Haiti’s youth is capable of improving their situations.